Centerville is not a hamlet; it's a county seat - so there must be lawyers - and there are probably a few thousand people. And it doesn't look too depressed, but it really feels like a place where nothing will ever happen. There's no noise coming from anywhere. I'm going to be glad to leave Iowa behind me, as that's been my experience of it so far - not much to attract the visitor. And my second floor motel room with its sixties-patterned wallpaper and furnishings is just a little claustrophobic. Continued rollers, but they're tapering off. 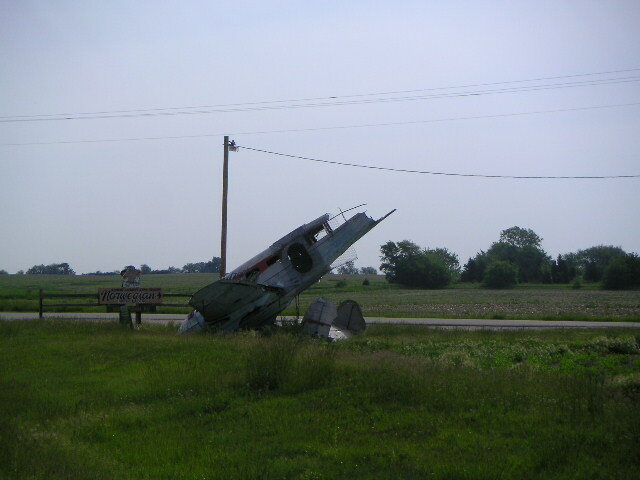 And the approach to Ft. Madison was actually pretty flat, as well it might be, so close to the Mississippi. I checked into the Super 8 motel on highway 2, which had been two lanes all across the state but was now four lanes, busy, and seemingly a stretched-out rural strip mall. So I walked half a mile west on the highway to find a dinner spot, ate, then to bed. 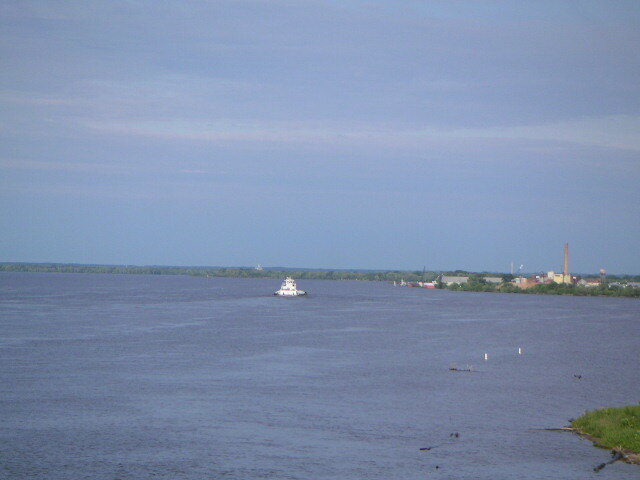 A milestone - the Mississippi. This is the second time I feel like a complete change has happened. The first was coming out of the Rockies at Ft. Collins, where mountain country turned into agricultural land. Now it's still agricultural, but the river seems to mark a big cultural difference. It's a lot less sleepy and maybe a bit greener on the east side of the Mississippi. 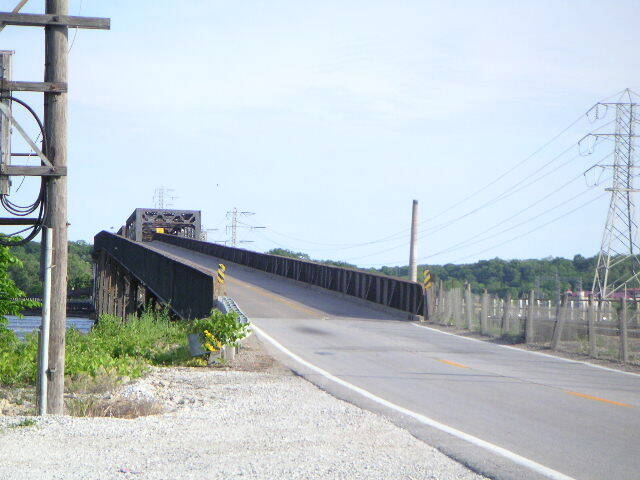 The bridge at Ft. Madison is a grand old clunker of a swing bridge. The lower deck is two railroad tracks, and the upper is a narrow two lane roadway with a toll gate in the middle. The whole contraption rotates around the middle pier to let river traffic through. My goal for the moment was now Peoria, or rather Jubilee College State Park, just a little before Peoria. I rode north along the river for a while, through terrain that was flat, dank, and a little foreboding in the antique decay of the towns and houses. But eventually I cut east into flat agricultural land, and zig-zagged along flat, quiet back roads to the seemingly deserted state park. There were cars there, RV's, even some tents at the campsites, but it was dead quiet. It seemed even bizarrely quiet. The park marks the site of a former frontier state college, but I saw nothing in the way of buildings or markers. It was all lawn with a few trees. Just as well, I just wanted to sleep. A bit of a bland day. It's flat, it's agricultural, and sometimes there's a river. I spent most of the day either alongside or very near the Illinois River, or the chain of lakes that has been made out of it. If it weren't for the continuing headwinds, it would be pleasant, fast riding. Ottawa looks like it sounds, although I may have been predisposed by its name to feel that way. As you come into town from the south, there are boathouse-looking affairs along the far side of the river. You then make a right turn onto the bridge into town, and are suddenly in downtown Ottawa, where there's a lot of the sort of dark, crenelated stone architecture I associate with the Canadian city (although I have to say I've never been there). This was definitely a motel night, but it was a very forgettable motel. A dull day, and a slightly too exciting one. 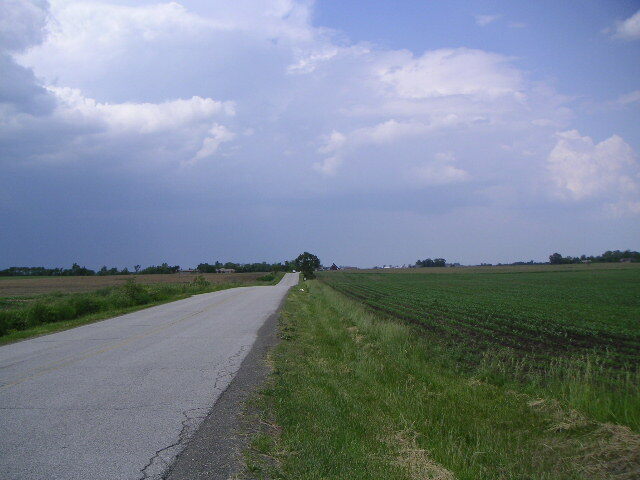 I couldn't figure out a way to approach Chicago on any sort of quiet road. 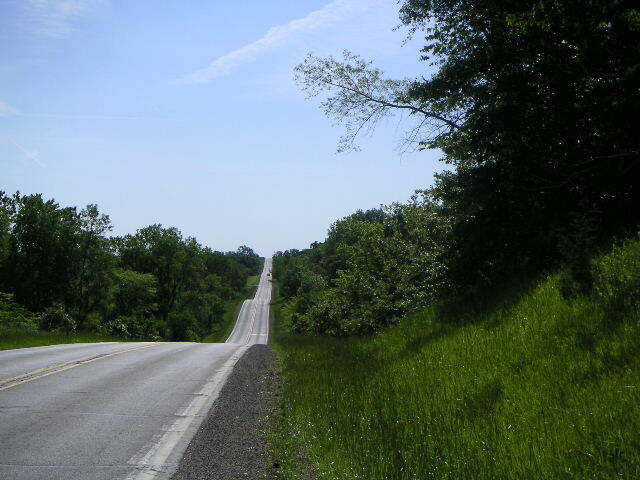 I eventually wound up on US 34 through Downer's Grove, riding for long distances on sidewalk as the road wasn't very hospitable. But this was dangerous, as I was anxious to keep a decent speed, but crossing intersecting streets on this sidewalk was just not safe. No cars were looking out for a bicycle suddenly springing out in front of them as they tried to turn onto the highway, and I came close to being hit once, maybe twice. This was all my own fault. 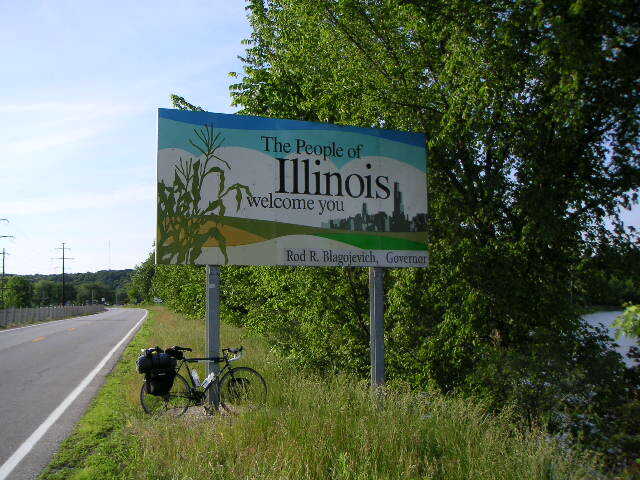 It has to be said, though, that of all the states I've ridden through, Illinois had the least bicycle-aware drivers. They seemed not to have ever seen one before. Entering Chicago was like entering any other large eastern city. Traffic, buses, decaying dirty brick buildings - I hadn't seen any of this for a long time. My sister and brother -in-law had just bought an apartment near the lake, a couple of blocks from the Hancock Building, and even though they hadn't moved in yet, that's where I headed, as I didn't really want to ride all the way up to Evanston. My sister was busy, so I changed into what respectable clothing I had and went out to dinner locally. Susan came by later in the evening to pick me up and bring me to Evanston. With my sister at work, and my nephew taking finals, in the morning I lazed around the house and dealt with e-mail and uploading pictures to the blog. Both were back in the afternoon, so we went out for lunch (Thai), and looked for a replacement tire for my rear wheel, as the original was definitely more worn than I was comfortable with. No luck finding a tire, though. So here I am after nine days of riding without a rest day, the last four or five of which were into a brutal headwind. So I’m pretty tired. I’ll be taking two days off here, then heading across northern Indiana and Ohio. The plan, of course, was that by going west to east I’d be taking advantage of prevailing west winds, but it hasn’t worked out that way. Every time I stop in a town and ask whether the wind shouldn’t be blowing in the other direction, someone says, “yes, ninety percent of the time we get a westerly wind - the weather’s been a little funny lately.” I can at least say that I’ve had reasonable luck with rain; I’ve ridden in serious rainfall only one day. I managed to dodge the very wet weather they were having, and apparently are still having, in northern Utah. This morning my nephew was taking SATs, so my sister and I ran errands, and I found my tire. I've been riding on Schwalbe Marathons, bought for the ride because they have the reputation of being completely bulletproof. They do have a high profile, though, and I think that may have contributed to some instability at speed with weight in the panniers. I bought a Continental Top Touring, which I've used before and which should certainly be fine to get me to New York. The guy at the shop where I bought the tire also gave me some recommendations for getting out of the city to the south. We went to see a stage adaptation of Wodehouse's Pigs Have Wings that evening, after a big pasta dinner. The crucial thing in getting out of Chicago was to avoid some of the worst of the southern neighborhoods, and the advice yesterday from the bike shop worked well for me. My sister dropped my off at their future apartment, where I had left my bike, and it was two blocks to the Lakeshore Bike Path, which took me a few miles south. After that came some fairly quiet city streets all the way out of the city. It was now important to get far enough south to avoid Gary before turning east into Indiana. It was at Beecher that I finally turned left. 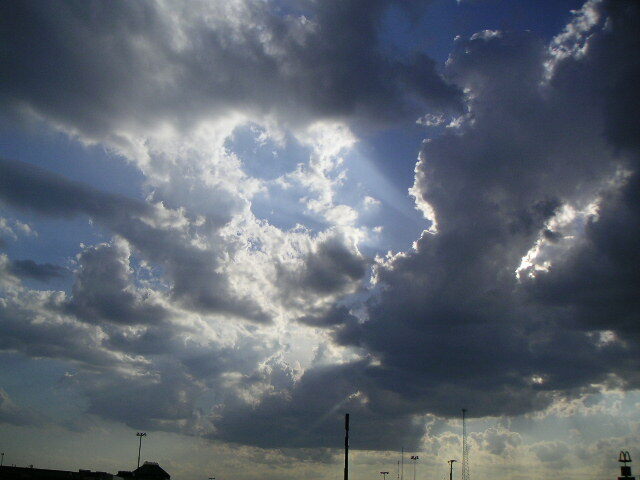 By this time, the weather was clearly getting threatening. There were huge clouds, ominous gusts, and giant bolts of lightning not too far away. So I asked locally for advice, and it was suggested that I head to Lowell IN, which had a motel in its eastern outskirts and was not too far away, nice because it really looked like I was going to have to run for cover soon. There was in fact a tornado watch in the area, and I clearly was not going to make it to a state park today. I had a serious tailwind by now, but by the time I got to Lowell - the town, but not the motel - there was a drenching rain, and I took cover under the awning of a convenience store for 45 minutes or so. But after a while it mostly stopped and I did the remaining five miles to I-65 and the motel.